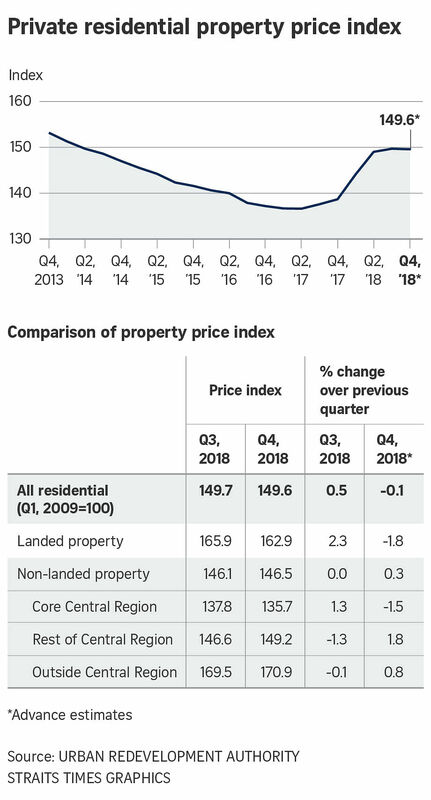 Singapore's private home prices saw their first quarterly decline since the second quarter of 2017, as the July 6 cooling measures ended a price recovery that lasted only five quarters, the shortest on record, analysts say. Private home prices dipped by 0.1 per cent quarter on quarter in the final three months of last year, sliding back from a 0.5 per cent increase in the third quarter, according to flash estimates from the Urban Redevelopment Authority released yesterday. For the whole of last year, prices still rose 7.9 per cent, compared with a 1.1 per cent increase in 2017. If not for the measures, property prices could have increased by more than 10 per cent last year, said Cushman & Wakefield's senior director and head of research Christine Li. Meanwhile, prices of resale flats fell 0.9 per cent last year compared with the year before, flash estimates by the Housing Board showed. Prices fell an estimated 0.2 per cent in the fourth quarter. While some expect the HDB resale market to continue its gradual decline in the year ahead, barring possible changes to usage of the Central Provident Fund for older flats, analysts pointed out that private home prices are already showing signs of stabilising, just five months after the cooling measures. In fact, prices have already reverted to at least where they stood when the cooling measures were introduced, said OrangeTee & Tie's head of research and consultancy Christine Sun. Huttons Asia head of research Lee Sze Teck noted: "(Also), this decrease in prices may not be significant and it appears to be driven by the landed segment." The luxury landed property segment saw prices falling by 1.8 per cent in the fourth quarter. "Being bigger-ticket items, landed home prices have taken a greater beating as demand softened," said JLL senior director of research and consultancy Ong Teck Hui. The non-landed segment, meanwhile, managed to eke out an increase of 0.3 per cent after staying unchanged in the previous quarter. That growth was driven by the city fringes or rest of central region segment, and the suburbs or outside central region (OCR) segment, which rose by 1.8 per cent and 0.8 per cent quarter on quarter, respectively. For the whole of last year, prices rose 6.2 per cent in the prime or core central region. Prices climbed 7.4 per cent in the city fringes and 9.5 per cent in the suburbs, respectively. The city fringes also saw the highest number of new launches in the fourth quarter. These included Arena Residences, Kent Ridge Hill Residences, Parc Esta and The Woodleigh Residences. These four projects managed to record fairly healthy sales, at median prices ranging from $1,699 to $2,002 per sq ft, Mr Ong said. Ms Tricia Song, Colliers International's head of research for Singapore, expects the city fringes to see fewer launches this year compared with last year, with key projects such as a 1,101-unit Silat Avenue site and the redevelopment of Pearl Bank Apartments and Normanton Park. Prices in the suburbs were held up by large launches that have been put on the market in the fourth quarter and earlier. These include Whistler Grand, Affinity at Serangoon, Riverfront Residences, Le Quest and The Jovell. "In 2019, we expect several large launches, such as the 2,225-unit Treasure at Tampines and 1,410-unit The Florence Residences in the OCR. Given the sheer size of the projects and potential competition, we expect them to be priced competitively. We expect the OCR to see some pricing pressure through 2019," said Ms Song.